Coffee is deeply sensuous. Not just the taste but smell is penetrative, all that is required to revitalize the senses. We have introduced a range of Coffee Flavor Incense Stick, the aroma of which enchants one and all. We offer Coffee Aroma Incense Sticks in varied sizes and in attractive packaging. It defies bad odor and increases the sensuous feeling. Our Coffee Incense Sticks are made from premium combustible items along with biotic materials such as essential oils, flowers, and coffee fragrance. The blending are made as per the traditional Indian custom of Incense making. 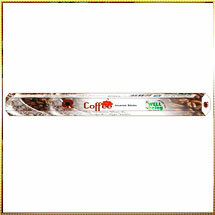 Moreover, we offer Coffee Incense Stick at the most discounted prices in the industry.